I have waited so long to be able to write this post, but now that the moment is actually here, I'm not sure what to write. The feelings that I'm currently experiencing are all over the place. Shock, excitement, nervousness, they are all there. We were totally not expecting this and if you had talked to me in private at all this week, you would know that. Every month that we have ever tried to get pregnant, I always test early. Like, crazy early. So this month was no different and at 11dpo (days past ovulation), I tested. Which of course was negative. It slightly crushed my spirits since I have gotten a positive test at 11dpo before, but I tried to remind myself that it was early and could still change. I waited two days and tested again at 13dpo, knowing that this would give me the true answer. I usually only have a 13 day luteal phase (when not on progesterone) so I figured testing at 13dpo would be pretty accurate. It was negative. I was devastated. I could not believe that this cycle was a bust and my heart literally hurt. This was our last go and it didn't work. This was the end. I went for my beta draw (pregnancy blood test) on Wednesday with a cloud over my head and tears in my eyes. And on the way home I did what any sane person in my situation would do, stopped for supplies. 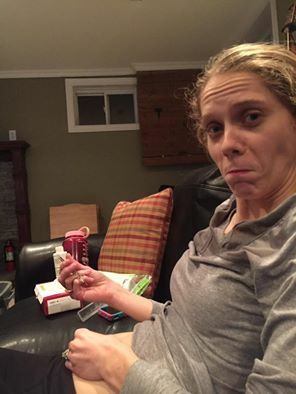 I returned home and crashed on the couch with yoga pants, junk food and a funny movie. I planned to stay there forever. Or at least the rest of the week. I was giving myself the week to wallow and then would pick myself up next week. Yesterday I got the dreaded phone call from the nurse telling me that the blood test results were negative. Or at least that's what I assumed the phone call would say. But instead, she cheerfully told me that my numbers were low and I would need to go back for a redraw. WHAT!?!?!? I was seriously shocked. I was 100% sure that this cycle had failed. But nope, she was telling me that I was pregnant. For those that speak this language, my beta was 12 at 14dpo. I know that the number is low but the only important thing is doubling, so I am hoping that we just have a late implanter on our hands and everything will turn out fine. For those that don't, it just means that I'm barely pregnant. I will get another beta draw today and that number should double (be around 24), which will tell us that this pregnancy is progressing well so far. Unfortunately, I won't get the results from today's test until Monday. Ugh, longest weekend ever. Dan and I celebrated last night with rhubarb juice. It was a leftover bottle from my sisters wedding that I was saving for this exact occasion. So that has been the crazy whirlwind of the past 24 hours. I'm only about 4 weeks pregnant but I knew that I wanted to share with you all because this baby exists and is loved and we are over the moon excited about s/he. No matter what the outcome of this pregnancy is, whether it ends in miscarriage in a few weeks or a baby in 9 months, it deserves to be celebrated. So please join us in cautious excitement and pray/send good vibes that this is our rainbow baby and this pregnancy moves forward as it should. Because I'M PREGNANT!!! To all my readers who are currently still in the waiting period of infertility, please know that I am thinking of you and feel for you and know how much pregnancy announcements hurt. If you need to take a step back from my blog, I totally understand. But I do promise that this blog will not turn into a baby blog and I will do my best not to flaunt this pregnancy. Updates here will be kept to a minimum and I plan on starting a separate blog for baby related stuff if we actually make it past our loss milestones. So on that happy note, I will get back to testing incessantly and trying to distract myself from having to wait so long to find out what the next bloodwork results are. This deal finally got finalized so that I could finally announce it on here! We bought a new house! We won't be homeless! This has seriously lifted a lot of stress off of us and it's so nice to know that come the end of November, we'll actually have a place to move to. So obviously there is still lots to tell and pictures to share and excitement to go around, but I'm going to leave you hanging for a bit. This week has been full of ups and downs and stress and I just don't feel up to going into all the details of how this new house came about. So be patient dear readers and I will do a more detailed post next week. But I will leave you with this lovely gem, don't you just love the bathroom? Needless to say, the house needs love and updating but we are very excited to get started on this new adventure. It has been ages since I shared any recipes with you guys and I thought it was time to bring food back to the blog. Because really, food makes the world a better place. My Facebook readers have requested recipes to give them meal time inspiration and so I will do my best to fill that wish over the next little while. Today's post is pretty simple and not all that exciting, but it's what we had for supper last night and it is one of our go to quick meals that I thought would be worth sharing. Since going gluten/dairy/corn free, take out really isn't an option anymore so it's important to have meals that are quick and easy to throw together. Our two go to quick meals are stir fry and noodles and sauce. Since the noodles and sauce is pretty self explanatory, I thought I would go with the stir fry recipe. First up, check out what sort of veggies are in your fridge. I almost always have carrots and broccoli on hand but occasionally there are more options in there to make things a little more exciting. Luckily for us, last nights stir fry got to have leeks, garlic, carrots, celery, red pepper and broccoli. Go me for keeping a well stocked fridge! Or more like, go me for using up old veggies that I had forgotten about. I usually use yellow onions because they are all I normally have on hand, but I had some old leeks in the crisper that were starting to slime so I decided to use those instead. All you do is cut up your onions, garlic and carrots and saute them in some olive oil until they start to soften. I usually only add salt, pepper and thyme for my spices but sometimes mix things up and throw in some cumin. Basically, this is where you can go crazy and do whatever you want! Once those first veggies are softening, throw in the celery and peppers to get them going. If I have mushrooms, they go in at this time too. Mix it all up and enjoy the savoury aroma that is now filling your kitchen. I love broccoli in my stir fry but you can put any sort of green vegetable like peas, spinach, green beans, etc. Just be sure to put the quick cooking things in at the very end, like spinach or peas. We like to put some sort of meat into our stir fry but it really depends on what is in the fridge. Leftover meat of any kind works well or you can cook something up special for it. Sausage makes a nice flavourful addition but it's more of a treat for us since we rarely have it on hand. Last night I had some leftover steak to use up so I cut it up small and threw it in with the broccoli. If you don't have any available meat, you can always add eggs. Once everything is mixed in, cover it for a bit to steam the broccoli and then once everything looks done to perfection, serve! I overcooked ours last night a bit because I timed things badly but it was still tasty. I just usually prefer the veggies with a bit of crunch. Serve over rice (or quinoa) and ta da! Now you have a lovely healthy dinner that came together in less than 30 minutes. That is my kind of awesome. Now for me to try and write out the recipe. Keep in mind that I make this amount for 2 people and there is usually some left over. But if you have a family of 6, you'll need to up the quantities. Put your rice on to cook. While the rice is cooking, heat the olive oil in a wok or large frying pan over medium-low heat. Once the oil is warm, throw in your onions, garlic and carrots. Saute for 3-5 minutes, stirring often to prevent burning. Add salt, pepper and thyme to taste. While the first batch of veggies are cooking, chop your red pepper and celery. Add to wok and stir to combine, cooking for 3-5 minutes. Add broccoli and meat, stir and then cover for a few minutes to steam the broccoli. Check often to make sure it's not burning or overcooking. Once the broccoli is fork tender, remove from heat and serve over rice. Enjoy! You can alter any of the veggies and feel free to play around with spices or cooking methods. This is just what works for me. If you don't have any meat on hand and want to use eggs, wait until the broccoli is cooked and then add the rice to the veggies. Stir the rice in and then crack two eggs into the middle of the wok and mix everything together. The eggs will cook quickly and then serve! Minus the ham. I've never actually wanted to see green ham but have been dying to see green eggs for ages! Ever since I discovered that different breeds of chickens lay coloured eggs, I have wanted them. Oh so desperately I have wanted them. Last year when we got our seven new hens (or so we thought they were all hens) we were really rooting for at least one or two of them giving us coloured eggs. But no such luck, always just boring old brown eggs. We hatched our own chicks this June and they are finally getting to the age where they are starting to lay. Much to our delight, when we collected the eggs on Saturday there was a green egg! I admit, there may have been some happy dancing and excited phone calls and texts to those who would share my delight. 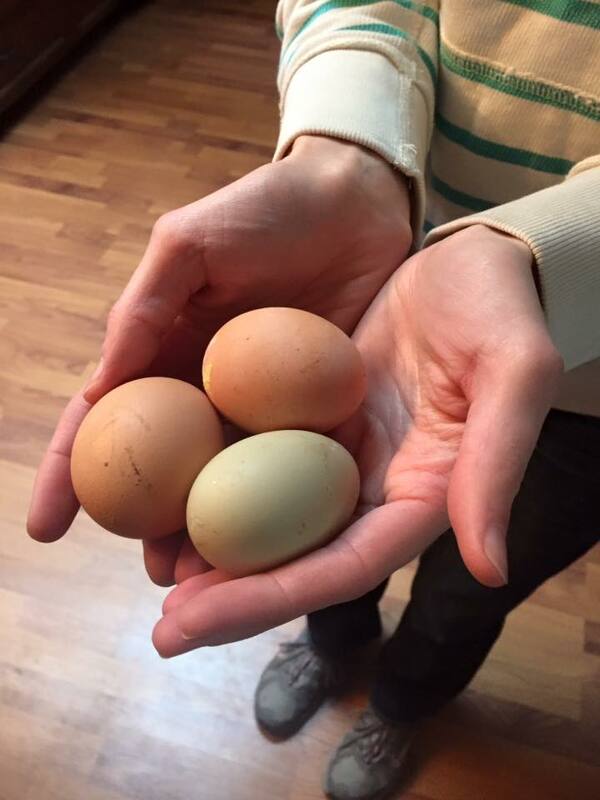 We have since collected two more green eggs which means the new little laying hen is in full swing! That or we have more than one green egg layer. Ohh wouldn't that be fun? We really have no idea which hen is laying these green eggs though. We have tried to look closely at each chicken to see if there are any hints (darker legs, etc) but haven't had any luck guessing since most of them have dark legs. I went out today and photographed each one so I thought I would share them all with you and see if I have any super smart readers who would be able to point us in the right direction! I did my best with the pictures but it's really hard to get good photos when you have skittish birds and a not so great zoom on the camera. Oh well, I did my best. So there you have it, our green eggs and mystery layer. Chime in if you have any input on who laid the green egg! Seriously, this is my new favourite post to do. It might just be my new series, even if it's slightly boring. 1. During all of our crazy early morning drives to Toronto, I tried super hard to enjoy them in some way. At one point along the Don Valley Parkway, there are some really nice trees that showed off their spectacular colours in the early morning light. I enjoyed them every day and tried to capture their beauty in this picture. It of course didn't work, but it still makes me smile. 2. We are starting to pack our house up and some awesome friends of ours just kindly gave us a whole pile of brand new boxes! We feel so fancy now, since we normally get our boxes from the LCBO or along the street on recycling day. <--- Ya, we're that cool. 3. I came across this photo on Facebook a while ago and it really resonated with me. I thought it was beautifully done and wanted to share it with you guys. 4. I made myself mini pies for Thanksgiving and they actually turned out super well considering the pastry is gluten and dairy free. I've been trying to be super controlled with eating them (I cooked one and froze three) but it's all I can think about. I love pie so much. I've already eaten three of them and the one lonely one left in the freezer is calling my name. 5. Our swamp in the fall is so beautiful. I love it so much and will most definitely miss driving through it during all the changing of seasons. Our road is one of the things I will miss the most about leaving this place. I hope you all have a great weekend and that it isn't too cold wherever you live. I'll be back next week with some posts updating you all on our life! Last Thursday Dan turned 30. Even though he has been dreading this birthday for years (even since he turned 26), I stilled planned on celebrating it. We didn't do anything too big, but I thought it was the perfect way to ring in a new decade. On his actual birthday we had a potluck with the College & Careers group at church, so one of the girls was super nice and brought a fancy cake for him. She even got him nice numbered candles, which I never would have thought of. Thanks Bobbi! On Friday night we had a small get together with friends where we ate spaghetti, used up leftover cake and played an awesome new board game. Super fun and low key, just the way Dan likes his parties. His birthday present from me this year was tickets to Dean Brody and Paul Brandt's Road Trip Tour which was on Saturday night. We had floor seats which were a good distance away from the stage so we really didn't get very many good pictures. But we still had fun, despite having to stand the entire time and our ears ringing afterwards. I think I'm getting too old for concerts. Overall, it was a good birthday weekend for Dan and I think he's accepting the fact that he's now 30. I'm feeling lazy and unmotivated when it comes to blogging this week. Maybe taking last week off ruined the good run I was on with posting. Or maybe it's because I wait until later afternoon to write something up and by that point I have lost all ambition. Who knows. Either way, I'm totally bailing on writing a post today and instead giving you a link to a post I wrote exactly 2 years ago. This day 2013. It's actually a pretty funny post and you should totally go and read it. You know you want to! I have recently partnered with my sister-in-law Trish to offer Comfort Care Packages to those going through pregnancy or infant loss. Trish is a consultant with Thirty-One Gifts and I lead the group Dreams of Lullabies and we thought that October would be the perfect month to launch these care packages, seeing as it is Infant and Pregnancy Loss Awareness Month. If you or someone you know has recently experienced a loss, please send me a message and we can get a Comfort Care Package sent out. Or if you are interested in donating towards one, contact Trish. We are over halfway through our injectable cycle and last IUI! The last few weeks were crazy and they pretty much wiped me out. I seriously don't know how people do multiple cycles of this or go on to the whole new level of craziness with IVF. We are only doing one of these cycles and I am 100% okay with that. I've decided to run you through what this past cycle looked like for us, complete with daily play-by-plays and random pictures. Exciting, right? Day 1: My period showed up on October 3rd so I called the clinic to let them know. They let me know instructions and told me to come back on Day 3 for my first monitoring appointment. Day 3: Went to the clinic for our first day of monitoring, picked up the first batch of medication and got final instructions. Started the Gonal-F (50 iU) injection that night. Day 4: Another Gonal-F injection. I'm so brave. Day 5: Return to the clinic for more monitoring. Everything is looking good, continuing with the daily Gonal-F injections. Day 6: Another needle in the stomach. Day 7: Back to the clinic! Picked up more drugs since I was running low on the Gonal-F. Doctor decided to up my dose to 75 iU. Another injection. Day 8: Dan was in a wedding in Napanee so we were there for the day. It ended early enough that I was back in the motel room for my injection time. Day 9: Woke up at an ungodly hour and sleepily drove the 2.5 hours from Napanee to Toronto for monitoring. Super fun. Started a new drug today and realized that Orgalutran is evil! It hurt so friggin' much and I may have been a huge baby about it. Day 10: Clinic time again for more monitoring. Bought more drugs (Ovidrel and Endometrin). Was instructed to trigger and excitedly gave myself the easy shot (Ovidrel) instead of having to do another evil shot (Orgalutran). Last shot of the cycle which makes a total of 9 injections given! Day 11: Monitoring, sperm wash and IUI day. Except there was a small chance of cancellation due to me (possibly) having too many follicles. The doctor opted for doing just one IUI instead of back to back ones in order to hopefully minimize the chance of high order multiples. Thank goodness the cycle wasn't cancelled or else we would have lost the $1,600 we spent on it already. Oh and we were super cool and brought donuts to the cycle monitoring nurses and our doctors office. It was the least we could do for them as a thank you for all the hard work they have done for us. Day 12: Ovulated today! Frig ovulation pain is no joke. Day 13 onward... longest two week wait ever! So that is where we are, waiting and waiting and waiting to find out if this cycle worked or not. The days are totally dragging by and I'm feeling very impatient. This is our last treatment cycle for a while (or possibly forever?) and it felt so weird leaving the clinic. Even though I totally won't miss the early mornings and all the poking and prodding, it still felt strange to be leaving behind a place that has been so much a part of our lives these last two years. I will be keeping you guys posted on the outcome of this cycle once we know, so be sure to check back later next week for results. In the meantime, send us good vibes that there is one (be specific with that one) baby growing inside me! Sorry for my lack of post yesterday, the day just got away from me. But luckily for you (I'm mostly looking at you Jackie) I am back today to share some random pictures! How fun! 1. Last week I went out and soaked up some morning sun, despite the cold weather. It was so refreshing and good for my soul. It started my day out so peacefully. 2. I got my hair cut earlier this week and looked super fabulous after she styled it. Too bad I can't have my own personal hairdresser to do my hair every day. Oh and isn't my hair getting long? 3. I came across this birthday card while sorting through stuff and was shocked to discover the scratch and sniff stickers still smell! It may have made me more excited that it should have, but I couldn't resist taking a picture and sharing it with everyone. They are over 23 years old! 4. We learned a new board game last week and it was so much fun! We had never heard of it before but loved it immediately and will be looking into buying it once we move. Anyone else ever played Colt Express? 5. I've been giving myself needles since Monday. Well, I actually got a friend to do it on Monday but since then, it's all me baby. I am super brave and tough. Well, not really but I pretend to be. And then eat a cookie as a reward once I'm done the injection. So that's basically it for this week. I'll do my best to post regularly next week but I'm not sure how I'll do. We'll be in the middle of fertility stuff so I might be too tired to think straight.